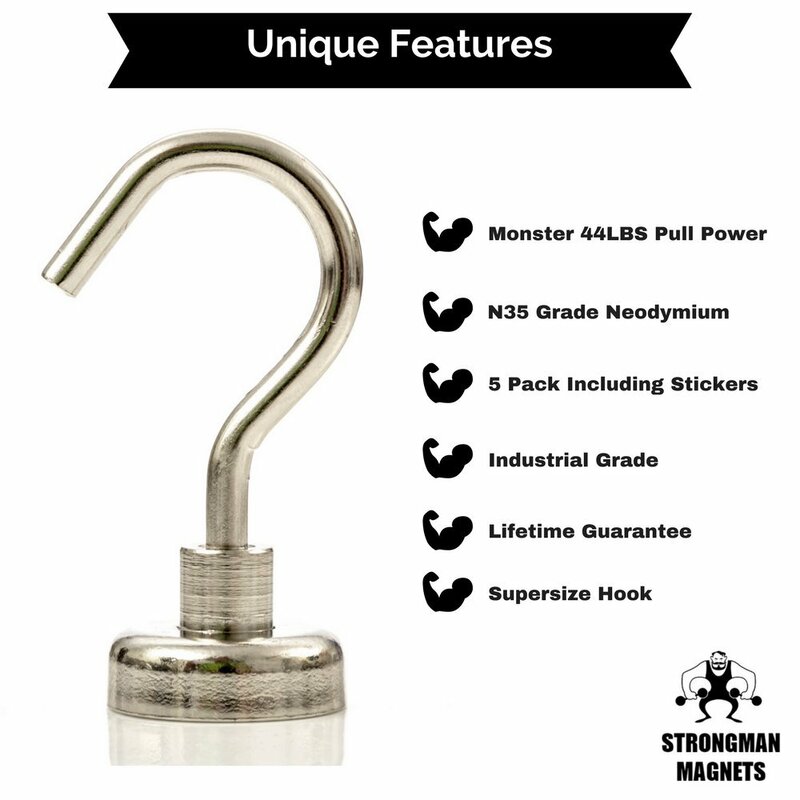 ✔ BIGGER PACK & HOOKs – 6 x 44lbs Magnetic Hooks with 6 x stickers. 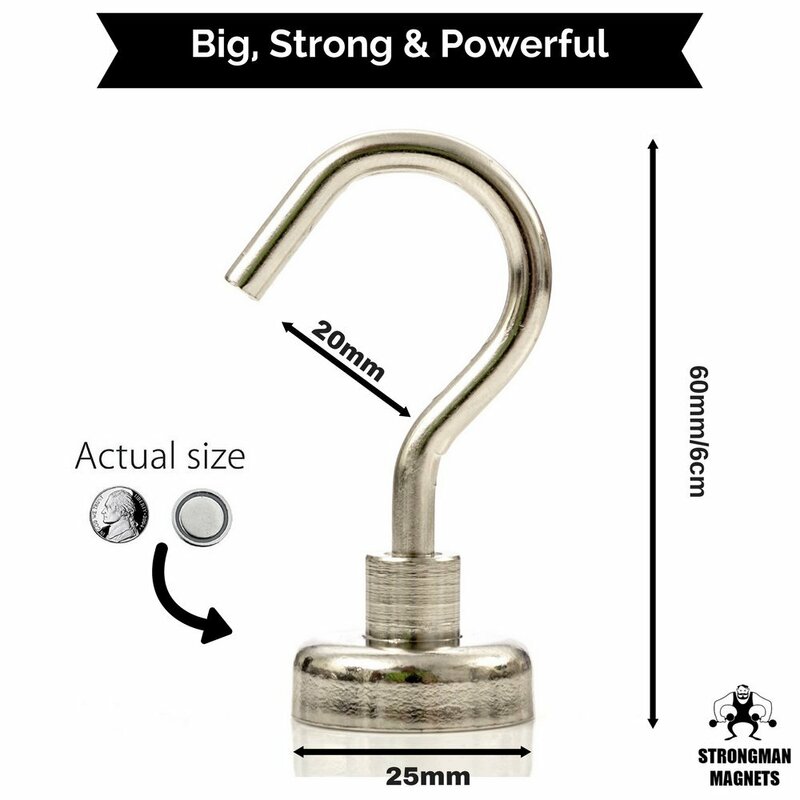 Our hook is larger than other suppliers (2cm opening) which means you can hold larger objects; smaller hooks are restrictive! – Are you sick of clutter? – Fed up of not having enough storage space? – Ready to take action? – Hundreds of uses perfect for Kitchen utensils, heavy work tools, sheds, filing cabinets, child safety, mechanics, wiring, washing lines, steel doors, cruises, the refrigerator, hanging up decorations and more! – Made from high grade Neodymium which is the strongest rare earth metal in the world! 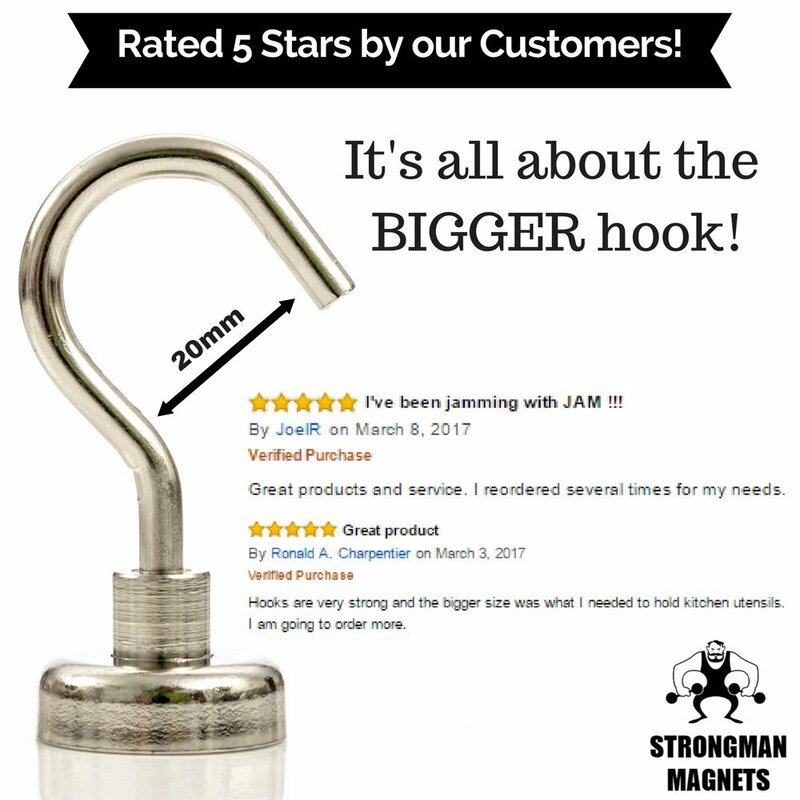 Important to achieve up to 44lbs pull strength the magnet needs to be attached to a horizontal surface – imagine the hook attached to a ceiling with a basket hanging from it. Vertical application the pull force is usually 1/3 weaker. Surface smoothness and steel thickness can also have an impact. DON’T WASTE YOUR TIME LOOKING AT OTHER PRODUCTS, WE HAVE THE BEST SOLUTION! BUY NOW BEFORE OUR SPECIAL PRICING EXPIRES!!! ✔ MULTI PURPOSE – Can be used indoors/outdoors, the kitchen, bathroom, bedroom, garage, lockers, office, your refrigerator or even on a cruise! The perfect storage solution! ✔ LIFETIME GUARANTEE – Your purchase is protected, return at any time if you are unhappy! What are you waiting for? It’s time to declutter! These hooks work well. You can use them then place somewhere else and use again. I had to buy another set,buddy stole my set for the garage,great durable,good cost. What an awesome idea, I need it immediately! 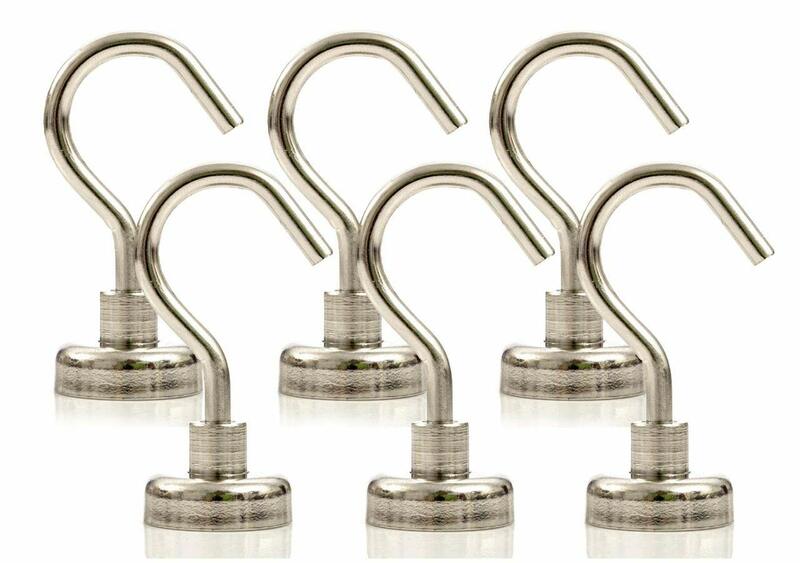 Metal hooks are much stronger than wooden or plastic ones and far more durable. I could get rid of plastic adhesive hooks in my house and garage and replace them with magnet hooks wherever it is possible. Highly recommended. I finally found a good option for hanging items on my steel entry door. I have wreaths and decorations on the one side, and then I have hats, coats, and similar things on the other side. 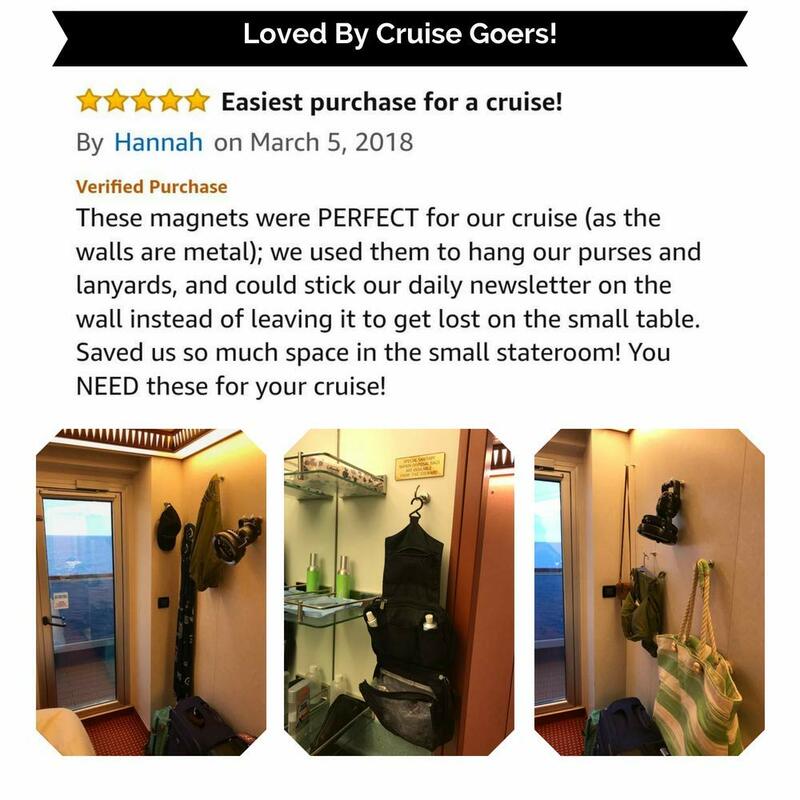 What is great about these magnets is they are removable, so when winter is over, I can just remove the hook from the coat side of the door. They do hold quite heavy items including winter coats.